I feel like a lot of the over-tutorializing of current games stems from the flawed assumption that new players don’t know how the controls work and run the risk of being overwhelmed. But the people who started playing during the time of games like Super Mario Bros. and Castlevania started out without any idea how the controls worked. They figured it out. Granted, the controls were less complex back then, but it is still possible in this day and age for game designers to teach the player controls through natural play. One of the foundations of modern education is “scaffolding.” The idea is that we learn best when new information/techniques/ways of thinking are connected to what the student already knows, so there is a “scaffold” that supports the learning of the new stuff. As long as the connections aren’t tenuous or forced and the environment is a safe, low pressure one, the student has the chance to make meaningful connections and learn. Game designers can use this idea to teach new players naturally, instead of constantly barraging them with hand-holding text. For example, moving through a 3D space in a third-person-perspective might seem like a daunting challenge, but nearly everyone has an understanding of moving around in a 3D space. We just have to build off that. In this case, the designer could create the early levels as a sort of low-risk area where new players can fool around and figure out how to use the joysticks to move about. Through simple experimentation, it will quickly become obvious that one joystick controls movement. Camera controls are a little trickier, but, by process of elimination, it’s not too hard to intuit that the other joystick might control the camera view. If the environment is compelling enough, the player will want to figure out the controls just to explore and collect whatever shiny bits the designer has strewn about. To extend the review’s analogy further, the original Super Mario Bros. is, in many ways, the Bill Murray character at the start of the film: serious, terse, and not very approachable. We loved that game despite of itself because, in context, it was the most adventurous game of its time, and the game we had to work with because it came with the system. 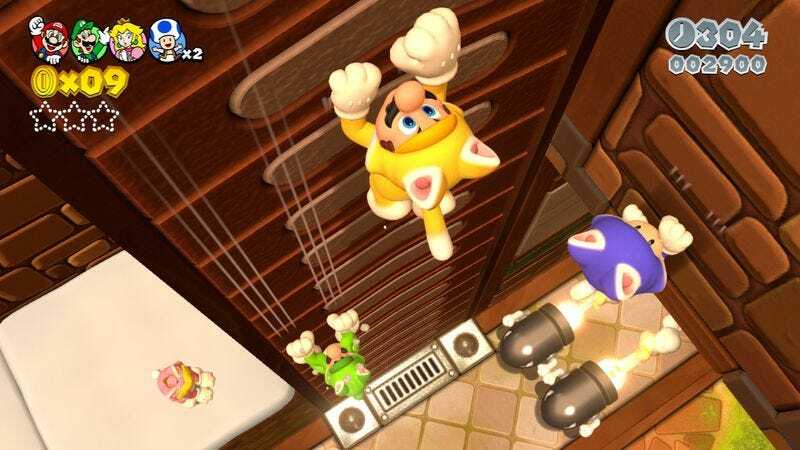 Newer Super Mario games share many of the core philosophies of the original, while trying to extend the adventure into new challenges and creating “accessibility” for people who would otherwise hate the original. The first game would never survive on its own in the modern mainstream game industry, and its descendants, while being fine in their own right, fail to capture the magic of the most adventurous game of its time. In the end, Rita still kinda liked Phil. He had his moments and, deep down, she wanted to like him. It seems to be the same relationship many people have with Nintendo these days. A couple of years ago, Nintendo discovered what it was they were missing, and these new games, 3D World and Zelda: A Link Between Worlds, are the first fruits of that discovery. I can’t wait to see what the rest of their “new day” brings. I actually quite like the comics and even enjoy the show. I think that Kirkman’s original idea of the comic series as a “never-ending story” (a premise implicitly inherited by the show), while interesting, actually sort of works against the series’ storytelling potential in the long run. It’s all well and good that we’re “never going to wonder what happens next,” as far as Rick and the gang are concerned, and I’m all for narrative experimentation, but a story without an ending is hardly a story at all. By knowing ahead of time that this game was going to be a relatively short affair with a definitive end, Telltale was able to infuse it will all sorts of pathos and meaning and give its characters actual arcs that allowed them to be changed by the events of the story. It’s almost a betrayal of Kirkman’s original vision for the world, but in terms of narrative payoff and investment in the cast, it works way better than the comics or show. You could try Android: Netrunner instead. It’s a LCG (Living Card Game), instead of a collectable card game, which means it doesn’t have new sets that come out all the time, but regular releases of expansion packs, each with fixed content. Every month or so, they release a new $15 “Data Pack” that has 60 cards in it—3 copies each of 20 new cards. They try to keep those Data Packs in print, too, so you can pick them up at your leisure. Also, it’s easy to find out the contents of each Data Pack, which is great for just picking out the ones you need. I also think Netrunner is a way better game than Magic. It’s much newer (well, a new update of an older game technically), so there are nowhere near as many cards or strategies. The design is also more interesting. The two players play different roles and have different objectives. One person plays the role of a futuristic Mega-corporation, while the other player plays a hacker trying to break into the corporate servers, bypass their ICE, and steal their data. What could be more fun than that? 1. Mana, the resource you use to play cards, is unlocked naturally each turn, rather than being tied to the cards you draw. It is beyond wonderful to never have to worry about situations where you’re not drawing any resources. Instead, every card you draw does something. 2. You can easily play without ever plunking down money. Since you get gold from new quests assigned each day, and a moderately good performance in the multiplayer Arena mode grants you a ton of gold, you can, if you want, play Arena and slowly build up your card base without ever having to drop a dime. It’s only if you want the best cards right away that you need to buy a bunch of packs. 3. Being online only, there are lots of card effects and actions that are possible that wouldn’t work if it was forced to mirror a paper game. 4. Once you have two of a card, you can “disenchant” any more you get and turn them into dust that is used to craft any card in the game. This is a very slow process, but it means that every card you win from playing gets you something. I would kill to have some use for the 60,000+ crappy commons I have on my Magic: The Gathering Online account from drafting. We have come up with two variations on Magic that are ideal for casual, laid-back social games. They can even be combined! The first is “Magic: The Drinkening.” In this variant, instead of taking life points, for every point of damage you take you must take one swig of your drink. There is no automatic death at twenty. You can keep going as long as you are willing to drink. Games in this version have a tendency to drag out into collections of massive armies of hugely powerful creatures with multiple enchantments, as there is little incentive to actually block attacks and prevent taking damage in the early game. The second is “Magic: The Deckening.” Instead of each player building their own deck, everyone draws cards from a single giant library of all of the cards in play. Each person gets their own discard pile, however. This pretty much eliminates the power of deck-searching combos, as it is most likely that even if the combo exists in the deck, you probably won’t be getting those cards. This also tends to last a while, as you could end up with a bunch of resources and no matching cards to utilize them. Those sound fun. I have a shoebox full of old Magic cards that’s just begging to get the Deckening treatment. Every couple of weeks, the Gameological Steam group, which you should totally join if you’re a nice person and into that sort of thing, picks out a new game to play and discuss in its Revue Club thread. Chum Joely, whose birthday it was yesterday (happy birthday! ), has been rallying the voters the last couple of days and just finished tabulating the results overnight. After a little drama (it was a tie!) it’s been decided that the group will be revueing Hotline Miami. A fine choice. That’s all, folks. Thanks for reading and commenting. Next week is shaping up to be a doozey, so brace yourselves. We’ll see you then!